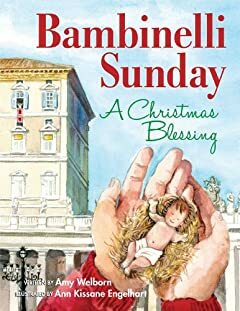 Bambinelli Sunday is the title of a book I wrote with the wonderful watercolor illustrations by Ann Engelhart. But it's also a real thing, this "Bambinelli Sunday." No, it's not on the liturgical calendar, but it's definitely a thing, started several years ago in Rome, and continuing today. Usually celebrated on the third Sunday of Advent , children of Rome are invited to bring Bambinelli - baby Jesus figures from their nativities - to St. Peter's Square for a blessing from the Holy Father.